Fast food isn't the most diet friendly option. However, with some planning and strategy, it's 100% possible to lose fat eating fast food. Fast food is fattening, addicting, low in vitamins and minerals, and it's chemically engineered to make our brains crave more and more of it. In fact, with a little bit of strategy and moderation, eating fast food can be a convenient way to get in a meal that will help you move closer to your fitness goals. You can lose fat eating fast food! Before I get too far into this article, know that I'm not advocating a diet of fast food all day, every day. The reality is that fast food is often high in calories and low in vitamins, minerals, and fiber - all of which play a major role in your health and fat loss results. First, I want to explain the real reason fast food makes us fat, and to do it I'll share a quick story about the early stages of my weight loss journey. Specifically, my fast food weight loss experiment I underwent to get my fitness journey started. Growing up, I was no stranger to fast food. Mcdonalds, Burger King, Wendy's, Taco Bell, Arby's....those places were my JAM! I vividly remember waking up every Saturday and riding my bike to Burger King for breakfast. Luckily, the weekends were the only times I would be able to go crazy on fast food. During the week the majority of my meals would come from the school cafeteria or cooked at home. It was at the ripe age of 16 – with a shiny new license in hand – that I started to up my fast food game. No longer dependent on someone else to drive me. I could go to any fast food restaurant I wanted! ...and that's precisely what I did. 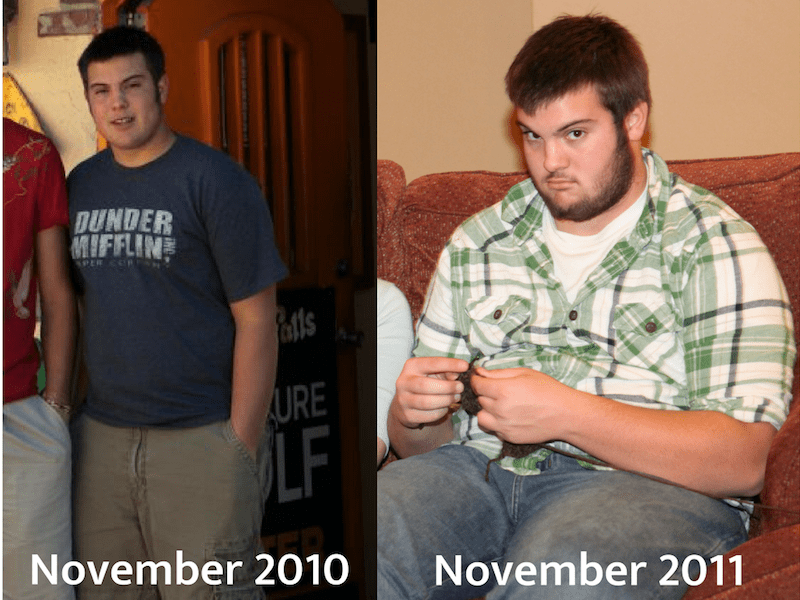 From age 16 to 17, I ate fast food every chance I got. Sometimes up to two-three times per day! Unsurprisingly, my new upswing in fast food intake came with a little extra weight gain. I was appalled, furious, afraid and humiliated all at the same time. I decided that enough was enough, and started my first official "diet." But I wasn't very successful at first. I spent 4-6 months spinning my wheels following strict and unsustainable FAD diets for a few weeks, only to burn out and return to my emotional stable of fast food burgers and fries. I was stuck in a Vicous Cycle of Dieting. Then one day, I had my light bulb moment. I came across an article about some coo-coo professor who ate twinkies and somehow lost 27 pounds! But the more I thought about and researched it, the idea of Calories in vs. Calories out started to make complete and total sense to me. So much so that I decided to conduct a similar weight loss experiment for myself using fast food. If the calories in vs. calories out theory held true, I'd lose fat. I ended up losing 20 pounds of FAT during the 6-week experiment! All while eating fast food every day of the week, and often multiple times a day. The act of eating fast food doesn't make us fat. Rather, it's the QUANTITY of fast food we eat which leads to unwanted weight gain. Instead, it's eating too many calories from burgers and fries that ends up doing damage to our waistline. Fast food was the main culprit that led me to gain 80 pounds of fat in just over a year. No doubt about it. But by simply adjusting the amount of fast food I was eating, I ended up losing 20 pounds of that fat in just six weeks. So far it seems like I've given you a "free pass" to eat all the fast food your heart desires as long as you monitor your calorie intake. There are a number of reasons why consuming buckets of fast food may not be the greatest idea for your health and fat loss goals. Typically, the more calorically dense food is, the easier it is to overeat and take in too many calories. 1. There's less total food volume - one of the main ways our body determines fullness is through stretch receptors in our stomach. As it expands, these receptors send signals to the brain that we're full. Fast food tends to contain a lot of calories for less food, which makes it's easy to take in a bunch of extra calories. 2. To your brain, fast food is like winning the food lottery - We are biologically wired to search out high-calorie foods that are sweet, salty, fatty, etc. High-calorie foods meant a greater chance of survival, so it's literally in your DNA to crave fast food. However, there are exceptions. Places like Chipotle and Subway have a lot of healthier options and higher quality ingredients. Also, traditional burger and fries fast food chains like McDonald's are starting to add healthier options to their menu. (although most people don't go to McD's to order fruit - they want Big Macs and french fries. I don't know if I totally agree with the "fast food is as bad as heroine" position, but I can attest to the "addictive" properties of frequently eating fast food. Like stated earlier, we are biologically wired to crave high-calorie foods for survival, and the duo of high-sugar and high-fat in fast food release a ton of dopamine and "feel good" hormones, which essentially tells us to "eat more, eat more!!" So if you're someone with addictive tendencies, it may be best to limit how much fast food you're eating. But Can You Make Your Fast Food Less "S.A.D.?" The acronym S.A.D. ironically stands for Standard American Diet which, in my opinion, wins the award for the greatest acronym of all-time. All three of those characteristics of the SAD diet naturally lead to a greater number of total calories being consumed. As mentioned before, most of the stuff we eat from fast food chains are high in fat, high in sugar, high in calories, low in vitamins & minerals, and processed out the wazoo! But, you can make it less "S.A.D." If you go in with a strategy and follow some simple rules (just like I did to lose 20 pounds), then you can make fast food healthier and fit into your fat loss plan. If you have the options to choose, then opt for a fast food chain that has the best options. "Fail to Plan and you Plan to Fail." Translation: if you do something without a plan, then you're only increasing the chances of screwing up. Instead of walking into a fast food restaurant and THEN deciding on the best option (while you're simultaneously wafting in delicious french fry aromas), plan ahead by looking up your meal online. If you already know what to order, you won't be as tempted or have to rely on limited willpower in the moment. It's like trying to run a marathon in hiking boots - you'll only be making things harder for yourself. If you're dieting, the last thing you should be doing is taking in calories from liquids, especially ones with tons of refined sugar like soda. They do diddly-squat for your hunger and end up costing calories that you could be using on solid foods that actually fill you up. Stick to water, calorie-free flavored water, or diet soda. 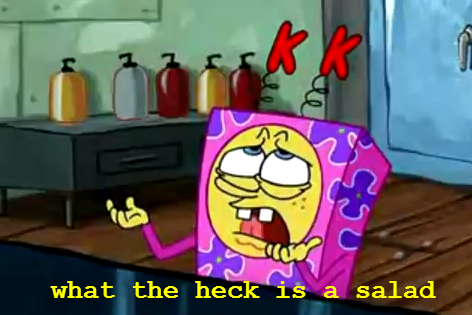 And I know one thing - Spongebob would cringe if he saw all these fast food restaurants offering healthy alternatives like fruit and "S-A-L-A-D..."
But in all seriousness, for us land-dwellers who are trying to watch our calories and waistline, this shift to a more "diet friendly" menu is a godsend! If you're going to a fast food place on a budget (calorically speaking), then consider swapping high-calorie sandwiches and sides for the lower calorie alternatives. Some fast food restaurants are better than others, but most of the big dog food chain seems to be adding healthier options to their menu. Let's be honest, most of the time we trot off to fast food restaurants, it's the greasy & salty french fries that we're look forward to. French fries – along with other high-calorie snacks – have been engineered to provide the perfect ratio and amounts of sugar, salt, fat, and calories to make them irresistible and send your dopamine levels through the roof. But, if your primary goal is to lose fat, then an extra helping of fries on the side may not be in your best interest. The idea of this strategy is to skip the french fries side entirely and opt for a second entree. Typically speaking, the hamburger or chicken tenders have slightly fewer calories and more protein than your standard side of fried starchy goodness. Strategies in Action - "Dirty but Dinky" or "Clean but Colossal"
If you follow the 5 strategies above, then you're well on your way to minimizing and even eliminating the fat-storing potential of your fast food munchies. But let's take it a step further so that you are even more confident in your planning. As I see it, there are two ways to go about ordering fast food while keeping the calories relatively low and your fat gain at bay. You'll either go "Dirty but Dinky" or "Clean but Colossal." Route 1: "Dirty but Dinky" - By going this route, you can still eat traditional higher-calorie fast food options such as cheeseburgers and fries, but in order to keep your calories in check, you'll need to order smaller sizes. This will rely heavily on Strategies 1, 2, and possibly even 3 to maximize the effectiveness. I used the "Dirty but Dinky" route during my fast food experiment. Instead of making a healthy Swap or doubling my entree, I simply reduced the quantity of food I was eating by choosing smaller portion sizes. Technically, I was still eating a cheeseburger and fries, but I was taking in significantly fewer calories by eating LESS actual food. The upside of this approach: I was able to satisfy my "craving" for greasy fast food while also sticking to my fat loss plan. The downside of this approach: You don't get to eat a lot of food volume, so it's may not be the best decision when you're ravenous, stressed out, or deep in a dieting phase on low calories. Route 2: "Clean but Colossal" - This route is for those who want the convenience of fast food while still eating relatively healthy. You can also get away with eating larger quantities of food without taking in an excessive amount of calories. This approach uses all 5 strategies, but especially 3, 4, and 5. With this route, you'll be swapping out high-calorie sides and entrees for healthier options such as apple slices, a side salad, a plain baked potato, grilled chicken sandwich, grilled chicken nuggets, etc. As you can see, I utilized Strategy 3 (zero cal beverages), Strategy 4 (healthy swap), and Strategy 5 (double entree), to make this meal nearly half the calories while actually increasing the total volume of food. Before I wrap things us, I want to give you some examples of how you could implement our 5 strategies and give you my top menu choices for going "Dirty but Dinky" or "Clean but Colossal" at some of the most common fast food restaurants. I'll try to keep each meal between 500-800 total Calories. Don't think that you have to follow these to the tee, though. If you design your meal using the five strategies we talked about, then how exactly you choose to execute on them is up to you. DD = "Dirty but Dinky"
CC = "Dirty but Colossal"
Third Note: all the meals are going to include a zero calorie diet coke or water because of my strong opinions on abstaining from liquid calories while dieting. Seriously...it's like asking for excessive hunger and stress! Fast food has plenty of faults. It's high in calories, generally low in vitamins and minerals (if you go the traditional burger & fry route), and incredibly easy to overeat. And although I don't think it's the only reason we struggle with gaining weight, it's definitely on the "Top Ten" list. But it's silly to think that you have to completely avoid fast food. There will be those moments when you are pressed for time or out with friends who aren't as focused on losing fat as you are and want their Mcdonald's fix. Decide whether to go "Dirty but Dinky" or "Clean but Colossal." 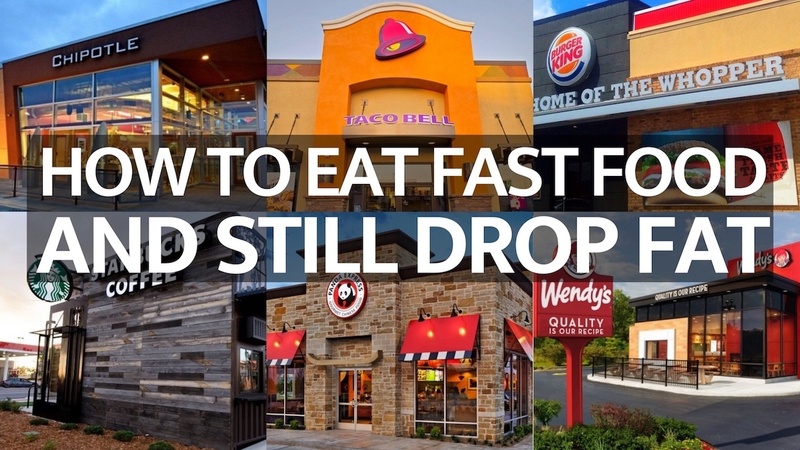 Have moderation with how much fast food you're eating on a regular basis. You'll be able to eat and enjoy fast food while dropping fat with ease.